The weeklong congressional recess for Presidents Day gives senators already running for president some extra time to promote their agendas, and all were taking advantage by visiting at least one of four pivotal early-voting states: Iowa, New Hampshire, South Carolina and Nevada. Sen. Cory Booker of New Jersey set the briskest pace Sunday, meeting supporters in Rochester and Manchester, New Hampshire. Sen. Kirsten Gillibrand of New York also was campaigning in the Granite State, and Sen. Kamala Harris of California was due there on Monday. In the Midwest, Minnesota Sen. Amy Klobuchar visited Iowa. Farther west, Massachusetts Sen. Elizabeth Warren campaigned in Nevada, the first Western state to vote in the 2020 presidential primary. The New Jersey Democrat told reporters he is reserving judgment after new reports about the alleged attack on "Empire" actor Jussie Smollett. When Smollett initially reported that he was attacked by two men who yelled homophobic and racial slurs, Booker called the incident a "modern-day lynching." In Chicago over the weekend, police said their investigation had "shifted" after detectives questioned two brothers about the attack and released them without charges. Smollett's lawyers said late Saturday that the actor felt "victimized" by reports that he played a role in the assault and would continue to cooperate with police. 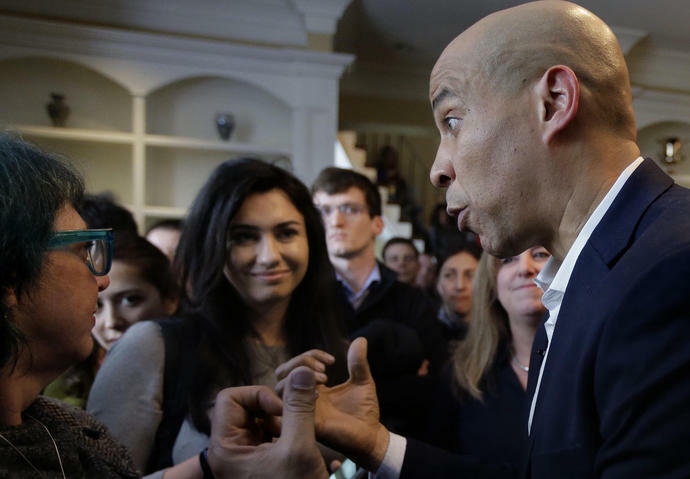 In remarks in Rochester, New Hampshire, Booker urged a broader fight against hate crimes and called for a unified pushback against "attacks on people because they're different." Later, amid music from old and new video games, the ringing of pinball machines and the sound of cans of domestic and craft beers cracking open, Booker talked policy at a "barcade" in Manchester. "I have done events in basements, I have done house parties, I have done union halls," Booker said as he surveyed the colorful arcade cabinets lined up behind him, including Pac-Man and Mortal Kombat. "I have never done a barcade." That didn't stop Booker from trying his hand at a number of games, including a newer, four-player Pac-Man game, and a vintage game - Q(asterisk)bert- after taking questions for a half-hour. Reflecting on the nostalgia, Booker said he saw his childhood "beckoning him back" and that he would challenge "anybody in the Senate to any of these games." In her visit to Nevada as a presidential candidate, the Massachusetts senator described a squeeze on working families and a political system that she says fails to protect homeowners, including the residents of Las Vegas who were pummeled by the mortgage crisis a decade ago. Warren spoke about her work as a consumer activist and her role overseeing the bailout of banks and insurers a decade ago, a job that brought her to Las Vegas to hear from residents struggling to keep their homes. "You better believe one reason that I am in this fight is we can never let this happen again. Never," she told about 500 people at a botanical garden and event center northeast of the Las Vegas Strip. Nevada's early presidential caucus is the first in the West and is seen as a key test of a candidate's ability to appeal to a state with powerful labor groups and diverse demographics, including a population that's about 29 percent Latino. In her speech, Warren condemned predatory mortgages targeted to minorities and said income inequality disproportionately affects communities of color. She also said unions need strengthening and that the country needs comprehensive immigration reform. The first Republican to move toward a primary challenge against President Donald Trump said he plans to campaign on what he calls Trump's reckless spending and lack of preparation in helping workers shift to jobs in a more automated economy. Former Massachusetts Gov. William Weld, who announced on Friday that he was forming an exploratory committee for president, told ABC's "This Week" that Trump is racking up $1 trillion a year in debt that will crush taxpayers. Weld said the government should be preparing workers to shift to jobs in "artificial intelligence and robotics and drones and machine learning and autonomous vehicles." But Weld added that policymakers aren't paying attention to that because "they're so busy with divisiveness and trying to make everyone feel awful." Associated Press writer Michelle Price in Las Vegas and Juana Summers in Manchester, New Hampshire, contributed to this report.